Jake DeBrusk suffered an apparent injury against the Toronto Maple Leafs on Thursday night. The Boston Bruins second-line winger was chasing down Mitch Marner on a shorthanded breakaway when he hooked Marner with his stick. Marner drew a penalty shot as a result while DeBrusk crashed into the board. DeBrusk had trouble getting up, and he left the game for a brief period of time before returning. However, he did get up slowly a few times in the third period after taking some hits. According to the Bruins' official Twitter, DeBrusk was not practicing on Friday. With DeBrusk out of the practice lineup, David Backes returned to the lineup. He skated on the third line along with Charlie Coyle and Danton Heinen while Marcus Johansson moved up to DeBrusk's left wing spot on the second line. 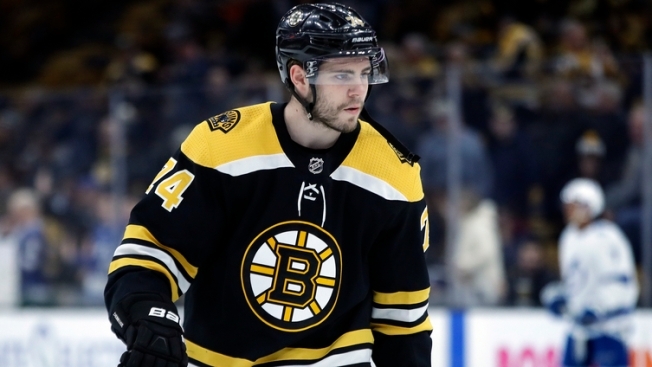 If DeBrusk has to miss the team's second game on Saturday afternoon, Backes will almost certainly re-enter the lineup after being a healthy scratch in Game 1. Here are the line combinations and defensive pairings that the Bruins used with DeBrusk sidelined.